Create your Christmas memories in Grapevine, Texas! Blanketed with millions of lights, enormous decorations, animated characters, and more than 1,400 events, it’s easy to see why Grapevine is the Christmas Capital of Texas! Enjoy dinner on your own or at one of our unique, group friendly restaurants in Historic Downtown Grapevine. 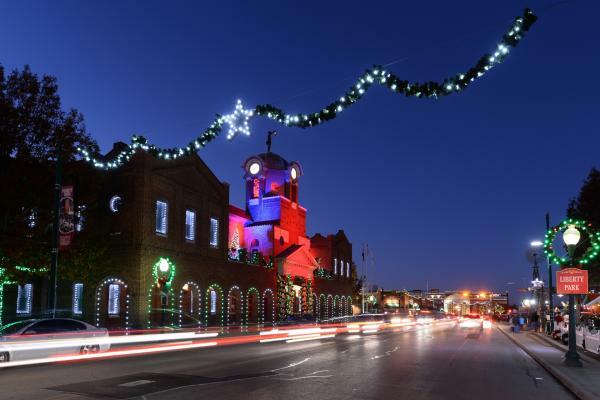 After dinner, take time to explore Historic Downtown Grapevine and enjoy the beautiful displays of lights and Christmas decorations including Grapevine’s nightly Light Show Spectacular. Kick off your day with a guided tour of Historic Downtown Grapevine. Following your tour, plan a visit to Vetro Glassblowing Studio & Gallery. 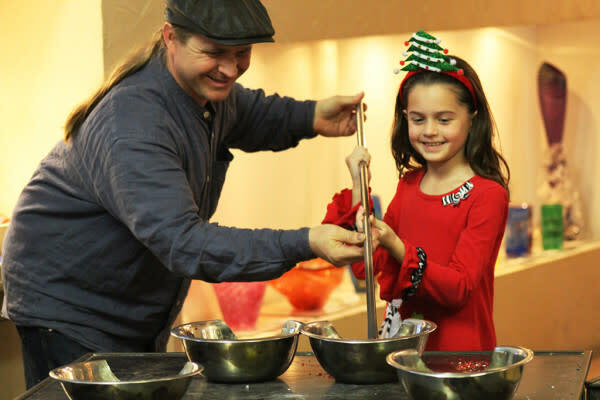 In additional to shopping for hand-blown glass art in Vetro&apos;s fine art gallery, special events also allow guests to work alongside professional glassblowers to help create their own glass holiday ornaments. View the Grapevine Glockenspiel, the only Glockenspiel in North America featuring the Would-Be Train Robbers, Nat Barrett and Willy Majors. Watch an exciting interaction between larger-than-life mechanical figures as they emerge from the clock tower daily at 10 a.m., noon, 2 p.m., 4 p.m., 6 p.m. and 8 p.m. Enjoy lunch at one of the group-friendly restaurants located in Historic Downtown Grapevine followed by an afternoon exploring the shops, galleries and winery tasting rooms, all decked out in their holiday best. Next stop is Gaylord Texan Resort, where you can enjoy a Lone Star Christmas with beautiful holiday scenery featuring over a million twinkling lights, 12,000 ornaments, a 52-foot-tall rotating Christmas tree and a life-sized gingerbread house! This evening, enjoy the Gaylord Texan’s Holiday Entertainment. From stilt walkers to singing cowboys to Santa Claus, there&apos;s something delightful around every bend. Before heading home, be sure to make one last effort to check off that holiday gift list with a stop at Grapevine Mills, with more than 180 stores. 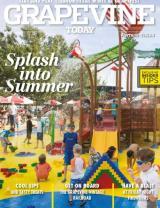 And located nearby is Bass Pro Shops Outdoor World! For more information, contact Tamer Attia, Leisure Sales & Promotions, Grapevine Convention & Visitors Bureau at 817.410.3164 TAttia@GrapevineTexasUSA.com.